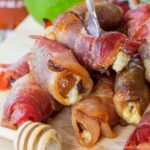 Sweet dates stuffed with blue cheese, wrapped in bacon and rolled in a sweet and spicy glaze. This hot gluten-free appetizer is always a favorite! In a small bowl, make the glaze by stirring together the honey, lime juice, and sriracha. Stuff about a teaspoon of the crumbled blue cheese inside one of the dates and squeeze it closed. Wrap tightly in one half slice of bacon and roll in the glaze. Place in a glass baking dish or glass pie plate. Repeat with the remaining dates, and if you have any extra glaze, pour it over the dates. Bake at 400°F for 15-20 minutes, or until bacon is browned and crispy.